In Camouflage, Bindi and her family are traveling to Singapore, where their good friend, Dr. Timothy Chan, who had once worked for them at the Australian Zoo as a reptile keeper, is opening up a new reptile park at Pulau Ubin, a beautiful island away from the hustle and bustle of the city. Dr. Chan’s favorite reptile, and the star of the park, is a Komodo dragon named Saffron. Bindi, her mom, Terri, and brother Robert, are enjoying spending time again with Dr. Timothy when something awful happens. Saffron goes missing out of her enclosure the day before the reptile park opens. Of course, the island is abuzz with workers and everyone trying to find her. Mrs. Yeoh, who has helped raise funds for the park, and is a person who likes to wear snakeskin clothing to a reptile park, helps as well, but obviously has a hidden agenda. She invites the Irwins to her big traditional Chinese banquet in celebration of the park's opening, which the elite of Singaporean society will attend. While at the party, the group discovers some interesting truths while listening to the guests. Will they be able to find the Komodo dragon in time before Dr. Timothy must cancel the opening of the park? 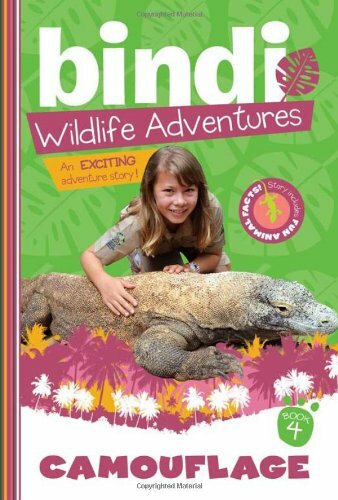 Children will enjoy reading and learning about Komodo dragons in this 112-page early chapter book. Camouflage is the fourth book in this new wildlife adventure series. Though the story is a mite predictable, children will love learning about Singapore as well as how Bindi and Robert solve the case. Komodo dragons are amazing reptiles, and the story focuses on the uniqueness of the reptile as well as their preservation. It also hints at the topic of people using their skins for handbags and such that has contributed, but is not the only reason, to this species being endangered. Readers will learn more about Komodo dragons in the fact file section in the back of the book. Children who love learning about animals and who are as devoted to saving them as Bindi and her family are will love this story and the direction of the series—a fun and educational alternative to traditional animal stories.